Mrs. Gwendoline Boyer, of Olney, was so badly burned on Monday night that she died. Her baby, which was in her arms, was saved by her husband, who leaped from a sick bed to try to save both.Enveloped in flames that leaped from her oil-soaked garments, Mrs. Gwendoline Boyer, aged 37 years, met a horrible death at her home in Olney. Miraculously, almost, her infant, which she was holding at the time her clothing took fire, escaped without injury, but her husband, George Boyer, and Emil Wireman, a farm laborer, were both severely burned in their efforts to put out the fire. The Boyers live in a three-story stone house on Maple avenue near Old Second street turnpike, and have carried on prosperous trucking business on the few acres which surround the dwelling. Some time ago Mrs. Boyer was taken sick and her illness developed into a severe case of grip. Her husband, too, became ill and was confined in his bed. Last of all the baby was attacked by the same malady, and with a ll the family down things were decidely gloomy. BEFORE THE ACCIDENTSlowly the parents improved, but the baby grew worse. So critical was its condition on Monday that hope was about given up, and it was then decided to have it christened at once. Rev. Dr. Upjohn, of Germantown was sent for and performed the ceremony in the presence of the sick parents and Miss Ruth Ingram, their nurse. Toward night the baby rallied somewhat, and when at 10 o’clock preparations for retiring were made the babe was carefully disrobed while lying in its mother’s arms. Mrs. Boyer sat near a washstand on which was a good-sized kerosene lamp and in reaching for some clothing for the baby the lamp was overturned. 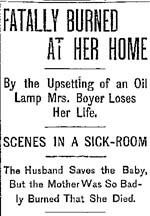 It crashed against the marble-top of the stand, the burning oil spreading all over the baby and Mrs. Boyer. In a twinkling the mother’s clothing was a mass of flames. THE HUSBAND’S BRAVERYFrom his sick bed the husband leaped to aid his wife and child. He succeeded in taking the baby unharmed from the mother’s arms and he quickly laid it on the bed. The he rushed to his wife’s rescue. Meanwhile the screams of the woman had brought Wireman and another farm hand to the rescue and the three men worked like mad to save her. They beat at the flames and finding that this did no good they carried the victim to a window and literally tore off the burning garments strip by strip. They threw the burning rags outside. Finally the carpet was torn from the floor and with this the men managed to smother the flames. When this was done the woman was burned from head to foot. Dr. Rush was called and hurried to the house. he saw Mrs. Boyer was fatally hurt, but with morphine he managed to alleviate in a measure her awful pain. The poor woman lingered until morning when she died. The shock, excitement and burns have caused Mr. Boyer to take to his bed again and he is pronounced seriously ill. Wireman is badly burned about the hands and arms, but is not seriously hurt. Quite recently Mrs. Boyer had come into posession of a considerable sum which was left to her by a relative. With this the couple had intended building a home in the city and quitting the truck business. George and Gwendolen Boyer had four children. The baby mentioned in the article was Wilbur Russell Boyer, Sr. born 7 Dec 1896 – he was barely 2 months old at the time of the fire. Wilbur’s brother, George Washington Boyer, Jr. was 4 at the time of the fire, and the boys’ older sister, Mabel G. Boyer was 7. Mabel died a few years later, at age 11 in Dec of 1900 from diptheria, unrelated to the fire. The family’s first child, Edith, died an infant in October 1888, eight years prior to the fire. The article mentions that the Boyer’s “have carried on prosperous trucking business..” – the meaning is not that they owned motorized vehicles, but that they were vegetable farmers. According to the Morris Dictionary of Word and Phrase Origins, the term ‘truck farmer’ was in use long before autos and trucks existed. The root of the word ‘truck’ in this instance comes from ‘troque’, the Old French word for ‘barter’. Wendy Smythe forwarded pages from the Boyer genealogy published by The Association of American Boyers that show the family of Jacob Boyer. We believe Jacob is the father of our George Washington Boyer, Sr. and this is the first independent confirmation of that conclusion. (See the Genealogue entry posted here in September 2003.). This genealogy also reveals to us the ancestry of Jacob Boyer going back to the immigrant to North America – Gabriel Boyer b. 1700 in Tartary ( a region in central asia) “where his German parents had gone for some reason or other according to tradition recorded by his great-granddaughter, Mrs. McCahon”. Gabriel Boyer is the 4th Great Grandfather of Bill & Evelyn Boyer. When exactly he came to America is not known, but he is reported to have owned a large farm in Oley, Berks County, PA (which is near Reading, Pa.) as early as 1733. Gabriel came to Frankford, Bristol Township, Philadelphia, PA a few years before his death in 1766. The mystery of “who died in the fire” still continues…..
Family stories say that one or both of George Washington Boyer’s daughters and possibly his wife died in a house fire. Up until the visit to Greenmount Cementery last week we did not know the death dates were all different, but that is exactly what the cemetery’s plot record shows. So from this it does not appear that more than one person could have died in a fire. The cemetery records also show that the only gravestone marking the plot is that of Baby Edith Boyer, however upon visiting, no gravestone, other than one that was illegible, could be found. Here is a photo of the plot at Greenmount – not much to see! Many thanks to Dottie (Rowen) Olson who provided lots of details on William Rowen, President of the Philadelphia School Board for many years. W. R. Boyer recalled that his mother, Elizabeth Carlin used to work cleaning houses for her “Aunt Kate” (Katherine Rowen) when she lived in the Logan section of Philadelphia. A new Boyer generation is discovered with the family of Jacob Boyer. Born cir. 1815, he appears in the 1870 U.S. Census living in Germantown, Philadelphia, PA – age 55. It is Jacob’s unknown first wife who had a son, and only child, named George Washington Boyer who was a homebuilder, and also a night watchman at the Fern Rock water bureau facility. George Washington Boyer is the direct ancestor of our Boyer line shown here. Jacob’s second wife, Margaret MERION, age 45 appears with him on the 1870 U.S. Census. Jacob and Margaret had 10 children including Del Boyer who lived in the Frankford section of Philadelphia and was an auto agency owner and John Boyer who worked on his sister Aleah’s farm. Our Carlin line begins with John William Carlin. He became the Base Commander of the Philadelphia Arsenal and married Mary Murchie of Ireland.